Section 101 of the Second Chance Act authorizes the Department of Justice, Office of Juvenile Justice and Delinquency Prevention (OJJDP), to award grants to juvenile justice agencies to improve reentry outcomes for confined juveniles. The Second Chance Act Program was designed to help communities develop and implement comprehensive strategies that address the challenges that reentry and recidivism reduction pose. This opportunity provides grants to support implementation of statewide reform plans developed under the Second Chance Act Comprehensive Statewide Juvenile Reentry Systems Reform Planning Program. North Carolina was one of six agencies awarded a planning grant in October 2014. 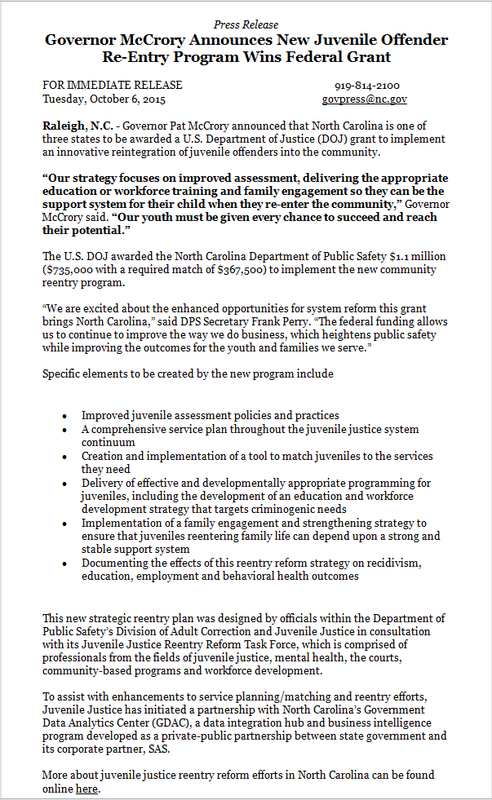 Based on the strength of its proposed implementation plan -- designed by a Juvenile Justice Reentry Reform Task Force made up of stakeholder groups interested in juvenile success -- North Carolina was one of three planning grant recipients awarded funding totaling $1,102,500 (including matching funds) by OJJDP in October 2016 to implement its juvenile reentry reform strategies. The Task Force identified four overarching objectives essential to reentry systems reform effort. Delivery of risk and needs-driven case planning and service linkage, and employment of effective supervision practices. Delivery of effective and developmentally appropriate programming, including education and workforce development services that target criminogenic needs. Engagement and strengthening of families of youth involved along the juvenile justice continuum, including reentry. Documentation of the effect of the reentry reform strategy on recidivism, education, employment and behavioral health outcomes.